A visual artist always has a set of decisions to make at the beginning of a work - how to compose the picture, what to emphasise, what to convey by the way the picture is composed. That is in part why so many people advocate doing thumbnail sketches before embarking on a painting or drawing; one needs to work out a sensible road map, a composition that works. Henri Matisse once remarked, "I don't paint things. I only paint between things." He paid close attention to the relationships between objects and how they relate to the whole composition. In a way, he was, in essence, creating an abstract web and underpinning to the composition by looking at the negative spaces, versus focusing on the "things". Look, for instance, at this Still Life with Geraniums which Matisse painted in 1910. There is a wonderful, energetic structure going on thanks to the contrasts between the horizontals and verticals and the organically curvaceous objects and flowers. Half-closing your eyes and looking at the negative spaces in the painting leads to a really strong, dynamic underpinning to the work. 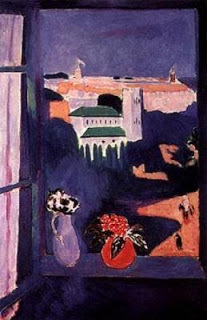 Yet there is also a sense of space and airiness that was one of Matisse's great skills. His paintings looked out, not inwards in a hermetic fashion. The deep blue knits everything together, but flattens the space into a near-abstract image. Matisse visited Morocco in 1912 and again in 1913, and the bright colours and flat perspective show the influence that Islamic art was having on Matisse. He had already brightened his palette considerably with his Fauve period, so it was a logical development to embrace the brilliance of the Moroccan world. He used the "differences" in this scene from his hotel window to knit together an enormously evocative and energetic composition. Another very different approach to the concept of composing a picture by concentrating on the spaces between objects can be seen in Rembrandt's prints. When he was working on his etchings, he was so technically skilled that he could fade out the contours of objects he was depicting and allow the "differences between things" to evoke the desired effect. Seventeenth century Italian art historian and connoisseur, Filippo Baldinucci, remarked, "that which is truly noteworthy of this artist (Rembrandt) was his remarkable style that he invented to etch in copper - that is, loose hatching and irregular lines and without contours he succeed in making profound contrasts." Rembrandt's 1654 etching, The Descent from the Cross, is one example. Few contours, wonderful spaces between "things" and an arresting composition all are rendered more powerful by this technique that Baldinucci described. In the same way, the spaces between, so expertly depicted and so vital to the composition, are masterfully achieved in this 1658 etching, The Woman before a Dutch Stove. For every artist working now, it is always rewarding to go back and study attentively what has been done by the great artists of the past. The Internet helps greatly in allowing us to see these images, but there is, even now, a huge difference between these digital images and the actual artwork. That is when seeing how Matisse actually applied paint to the canvas as he evoked those relationships between things, or peering at Rembrandt's etchings, with their amazing hatching, through a magnifying glass, allow us to see the artist's hand and deft, skilled touch. Those details allow the ultimate consolidation and achievement of the composition, the relationships of things one to the other and thus to the whole work.